December 11, 2018 - 6:30 p.m. ~ December 11, 2018 - 9:30 p.m.
December's meeting has no guest speaker. Instead, it is our annual Swap and Social night! Tasty sweet and savory treats will be provided along with refreshments for all. Come knit/spin/crochet, chat and enjoy some restful social time for the evening. If you want to participate in the mystery swap, bring a skein of yarn in a paper bag. We’ll bring bags too. Just make sure it’s something nice that you would gift to a friend- you may be seeing it again! Everyone will pick a mystery bag to open in turn and then all will get a chance to steal. Will you bring home what you started with? No one knows! For an added spin this year, we won’t have the yarn sale table open but anyone is welcome to bring a basket of yarn they want to destash through trade or sale. If you see someone with a basket of yummy looking yarn, then feel free to approach them to work out a deal. 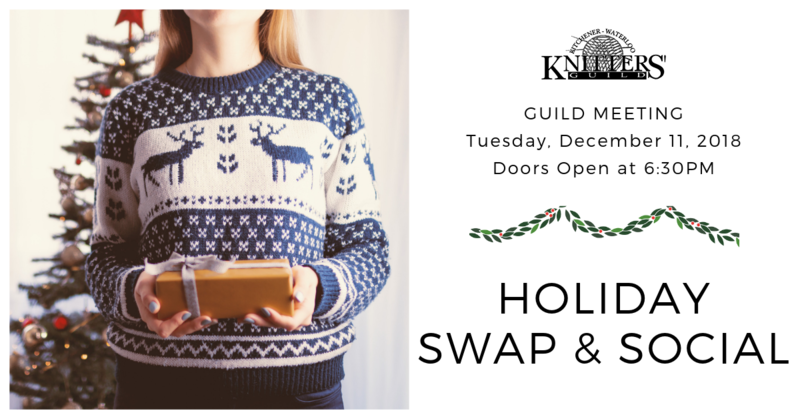 Monthly K-W Knitters' Guild meetings run from September through May on the 2nd Tuesday of each month. Members may attend all meetings free of charge. Guests may attend up to two meetings per year for a nominal fee of $5.